The layout of the shoe bolt holes will depend on the type of tension hoop you have chosen to use. For the notched tension hoop you will have to make the shoe bolt holes match the pre-existing hook spacing on the tension hoop. If you have chosen to use a grooved tension hoop you can choose your own spacing. The layout procedure for the grooved hoop follows. The spacing between each shoe depends on how many hooks are called for. 10 on each side of the rim is a good number that will allow for even tightening of the head. Remember that some of the space on the rim will be taken up by the heel of the neck, rendering that area unavailable for hooks and shoes. The end pin bolt that will hold the dowel to the tail of the rim will also need a hole. The depth of the shoe bolt hole is important. The nut should not protrude past the back edge of the rim. Use the square to mark a straight line where the middle of the neck will sit on the rim. Find the opposite of this mark by measuring around the rim with a flexible tape measure or a piece of string. When the measurement or length of string from both directions is the same you know that you have found the opposite side. Mark another straight line at this point. This is where the end pin bolt hole will go. Now figure where the hook next to the end pin bolt hole should be. 1.5″ is plenty in the case of a 12″ rim. Perhaps a little less would be fine as well. Mark it on each side of the end pin bolt hole mark. At this point put the neck on and mark the outline of the heel, then remove the neck. I like to have my first hook about 1/2″ – 3/4″ or so from the front edge of the neck, mark that too. 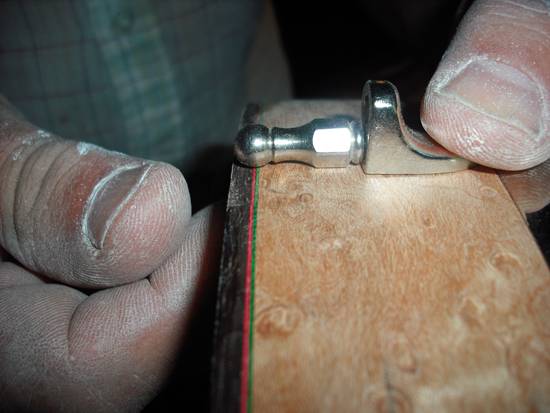 Use the flexible tape to measure from the mark (not the end pin mark but the first hook mark) at the tail of the rim around to the mark up by the neck, note the measurement and divide it by 10. That gives the hook and shoe spacing. There are other good ways to arrive at hook spacing. Mac has a jig that he uses with the Shop Smith. It spins on a pivot. I have used a regular drill press for the job as well, marking the spacing as noted above. When drilling through the rim it is good to have some kind of backing to prevent tear out on the inside of the rim. To find the right size drill bit just experiment with scrap and one of the shoe bolts. A pivoting jig used for drilling shoe bolt holes. The end pin bolt hole is not quite the same as the shoe bolt holes. It has to line up with the dowel that it screws into on the inside of the rim. It generally has the same diameter as the shoe bolt holes. Put the neck in and secure it in place with the neck brace. 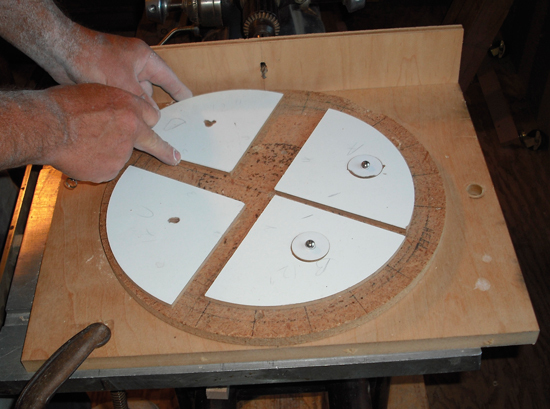 Mark a square where the tail of the dowel stick touches the inside of the rim. Remove the neck and find the center of the square. Measure carefully and transfer the measurement to the outside of the rim. Make a small hole and put the neck back in to be totally sure it is in the right place. Make sure the hole in the rim and the hole in the dowel line up, if they do go ahead and drill the hole out the rest of the way with correct bit.